Tikijian Associates is pleased to announce the sale of Barrington Estates Apartments on the popular and affluent far north side of Indianapolis. Built in 1966, the 144-unit community is in an excellent location and features stately Georgian architecture and all red brick exteriors. Tikijian Associates represented the seller, Barrington Estates, LP and the property management company, Kansas City based Maxus Properties, Inc. Founded in 1987, Maxus manages over 12,500 apartment units as well as almost 500,000 square feet of commercial space in fourteen states. The buyer is Indianapolis-based Buckingham Companies. Buckingham is a full service real estate firm specializing in the development, construction and management of mixed-use, multifamily, commercial and hospitality properties. Buckingham owns and/or manages 48 properties in seven states, and has developed some of the highest profile apartment and mixed-use properties in the Midwest. Buckingham plans significant investment in unit upgrades and community amenities and will manage the property through its operations division. Tikijian Associates is pleased to have represented the seller in the sale of Eastway Court Apartments, a 286-unit community in Greenfield, Indiana. Greenfield is a suburban community just east of Indianapolis. Because of its strategic location near Indianapolis and interstate highways, Greenfield is a growing community and home to a number of large employers. The property was built in multiple phases between 1959 and 1994 had been owned and managed by the family of the original developer since its construction. Eastway Court consists of 41 residential buildings, an office, laundry facility and several storage barns situated on almost 50 acres. 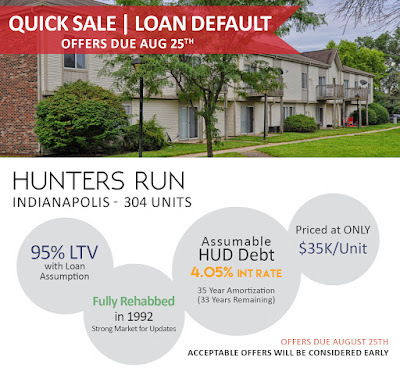 The buyer was Renewing Management, an Indianapolis-based owner and manager with a focus on the acquisition, rehabilitation and stabilization of multifamily properties. Renewing Management is planning significant capital improvements at the property, including construction of a new clubhouse/community building. The new owner will supervise construction and operate the community through its affiliated management company.